Rollins is about to embark on several years of capital projects, starting with a complete renovation to Mills Memorial Hall. 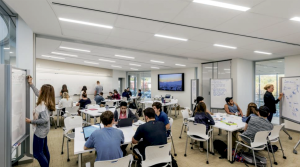 As the center of campus, the building is expected to be a hub for student activity and a full representation of Rollins’ mission; however, its outdated structure and former purpose as a library prevents it from accomplishing those goals. Starting this summer, Mills will undergo a complete transformation to be more student-focused and oriented towards the college’s mission of developing students as global citizens and responsible leaders. Below, you will find some tentative and developing design plans that lay out the future of the building. A bird’s-eye view of the first floor (top) gives a conceptual idea of how the student spaces will be situated next to student media spaces like WPRK. Classrooms, projected to be located on the third floor, will have tables and large white boards designed for collaboration. 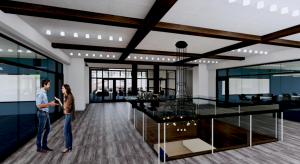 This summer, renovation work will begin on the Mills building in order to realign it with Rollins’ core mission of preparing students for global citizenship and responsible leadership. A chunk of the reasoning behind the upcoming renovation is that, currently, when visitors see Mills sitting prominently in the center of our campus, they assume it must be an important building. However, upon entering, it can be rather underwhelming, and its role is not immediately clear. 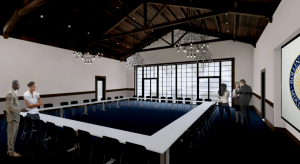 One of the primary goals of the renovation is to bring the interior of Mills into concordance with its impressive exterior. “Mills should be our Cinderella Castle,” said Mickie Meyer, the Lord family assistant vice president for Student Affairs. 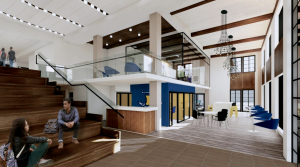 Fairytales have their place, but the reality of the renovated Mills building will be a new mission center of student engagement and activity focused around Rollins’ core missions. Students will have spaces to meet, interact, and work together on projects, showcasing twenty-first-century liberal arts in action. Mills Memorial Hall was built in 1951 as Rollins’ second library. 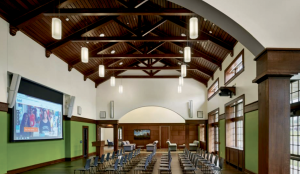 The beams and stacks you see today represent the specific needs of that structure; furthermore, its design is not up to date with today’s academic or accessibility standards. Therefore, while giving students a space to come together, the renovations will also make the building fully functional and accessible. Meyer explained that everything used in the construction process will be locally sourced, and, when possible, recycled materials will be used. 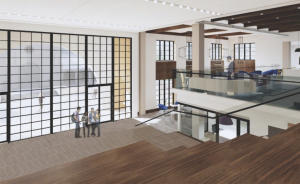 Much of the new incarnation of Mills will be designed in glass, with the rooms and halls containing modern, movable furniture reminiscent of the Bush Science Center, which shares the same architect as Mills: Melissa Burns. The entire building is to become more student-oriented, with a focus on technology and sustainability. The tentative plans divide the building into three floors. 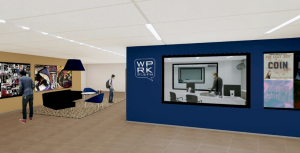 The first floor will contain the Center for Career & Life Planning, the Office of External & Competitive Scholarships Advisement, the Pre-Health Professions Advising Program, and Student Media, which will include WPRK and The Sandspur. The second floor will constitute the Center for Leadership & Community Engagement, the Social Entrepreneurship & Business Program, the Social Entrepreneurship & Innovation Hub, the Office of International Programs, the Office of International Student & Scholar Services, and the Rollins College Sustainability Program. The third floor will be home to the Galloway Room, two seminar rooms, and two classrooms. 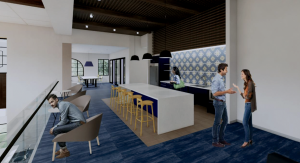 There will also be a film-screening room, a podcast/recording room, and the Fox Den—a student lounge that comes with a kitchenette where students can cook meals and hang out. The building will be decorated in the Mediterranean style, a large part of Rollins’ charm, but with a modern twist. Artwork and decoration will tell the stories of both current students and alums and may include a world map displaying where students are doing independent studies or otherwise making an impact on the world. While construction is going on, the current faculty, staff, and student organizations that occupy Mills will be temporarily relocated to various places. Construction is due to start this July and be completed before students arrive back on campus for the Fall semester of 2019. Students should expect sidewalk and lawn closures, crews and large equipment, and demolitions throughout the year. There will be meetings to impart information to students, and campus-wide updates will be sent over e-mail when needed. The Mills renovation is only one of approximately 12 building projects that will be going on across campus, including the addition of a new residential hall. First floor: Career & life planning, Student Media (Sandspur and WPRK), and competitive scholarships. The offices placed on the first floor will be designed specifically for student engagement and collaborative workspace. Second floor: Leadership & community engagement, social innovation & entrepreneur hub, international programs and scholarly services, and sustainability office. (Top) A small kitchen space, tentatively named the “Fox Den,” will be for Rollins students, staff, and outside vendors to use. (Middle) The office spaces for employees will all be the same size with see-through windows, similar to Bush. 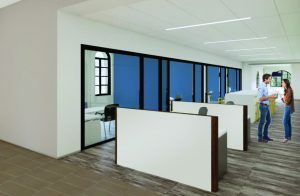 The layout of the floor is designed to bring integrated offices together. Third floor: Galloway room, two classrooms, and two seminar rooms. larger and more inclusive than current Galloway room in Mills today. The wood paneling throughout the building is projected to come from locally-sourced cedar.